Trusts that an environment conducive to the full and secure expression of the crucial skills of our colleagues and respectful of their dignity will be achieved shortly. 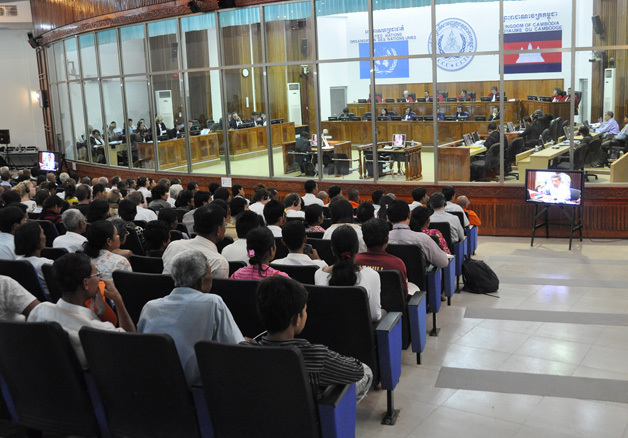 The Extraordinary Chambers in the Courts of Cambodia (ECCC) are a national court, under Cambodian jurisdiction. The ECCC is provided technical assistance through the United Nations Assistance to the Khmer Rouge Trials (UNAKRT). Both entities are funded separately. The ECCC operates through funds earmarked by the Royal Government of Cambodia (RGC); UNAKRT's budget is determined by donor states. The ECCC are funded by the Royal Government of Cambodia and have also received dedicated financial support from international donors over the past years. The RCG has repeatedly stated publicly that it has already made its maximum contribution for the 2013 budget for the ECCC. UNAKRT's yearly budget is determined by the community of donor states. All sections of the court, including the Interpretation and Translation Unit (ITU)) are staffed by national (ECCC) and international (UNAKRT) personnel. Some of the international interpreters at the ITU are members of AIIC. · On 21 December 2012, national staff, including Cambodian interpreters and translators, were told that they would not be receiving contract renewals and salaries due to of lack of funding. · On 22 January a petition to boycott work, effective as of 18 February was announced by national staff. The boycott was then postponed to 28 February, on the basis of a promise made by the administration that a solution would be found by then. · National staff continued to work with no contracts and received no salaries for the months of December 2012, and January and February 2013. · On March 4, at the start of the court hearing, the national interpreters announced that they would not resume work unless their salaries for December, January and February were paid to them. They then left the booths and the boycott became effective immediately. · On the same day, 4 March, national ITU staff were called to a meeting with administration. They were asked to resume work immediately. Staff refused. · At another meeting that day, they were told that they could be dismissed and replaced. · On 5 March, Cambodian interpreters agreed to resume work upon payment of their salary for December 2012 only. If no contract for 2013 were signed by the end of March, a new boycott would be implemented as of 1 April. · As of now, no formal reply has been received. National staff continue to report to their office. · There have been no court hearings since 4 March 2013.